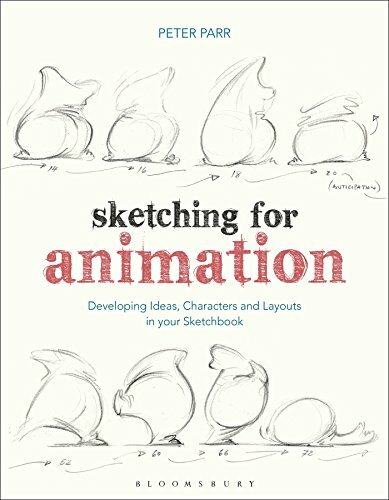 Sketching For Animation feels like an academic book to me, and it's priced like one too at USD $49. The book looks at the overall view of sketching and how it's useful for animation. The subjects discussed are using shapes, perspective, drawing figures, landscapes, capturing movement, developing ideas, characters and layout and composition. There are tips and techniques being discussed but they are mostly written in the form of observations, or quotes from other artists. What's good is you'll be able to know a wide variety of drawing principles involved to create a good piece of art. The downside is there aren't a lot of specific instructions or rendering techniques so to pick up those skills you will have to explore books that are more in depth. Another highlight of the book is there are lots of ideas for drawing. The author Peter Parr has numerous examples that can give you insight on things and places to draw, and also learning points to take note of. There are also short assignments at the end of each chapters. What I find lacking in the book is perhaps the connection between the sketching techniques and animation. While there's attempt to refer to sketching techniques taught to animation but I felt there could be more examples or perhaps reference to more well known animated films or shorts. The last few pages are more interesting because they feature artist interviews and gallery of work and you can read about their thought process for their films and project. Overall, it's a nice book with lots of ideas and quick tips on sketching. It's like an introduction to sketching that teaches you the benefits but when it comes to the exact techniques and application, you might learn more with books that are dedicated to specific areas mentioned in the chapters of this book. Peter Parr also has another book published recently called Zen of Drawing which also feels like an extension of this book.